Looking for deals in Blackpool? Located within Blackpool FC’s Bloomfield Road stadium, The Blackpool FC Hotel offers modern accommodations with pitch-side views. Guests can use the gym and free Wi-Fi. Very clean and the staff was extremely helpful. Located a few steps from Blackpool Winter Gardens Theatre, Adelaide Lodge is well located in the Blackpool Central of Blackpool. I love everything in this hotel. I didn’t expect it would give me a big smile during my 3 days stay here. Definitely I’m coming back next year! And will book as early as possible esp when ur planning of going during the Dance Festival week.. This place and any other places in the-same street will be fully book fast. Holmeleigh Hotel is located in Blackpool, an 8-minute walk from Blackpool Pleasure Beach. Excellent. Would highly recommend it and will definitely be going back. Hotel Rouge features a terrace, shared lounge and bar in Blackpool. Everything about this lovely BnB was great. From the warm welcome to the glorious furnishings. I had a very comfortable single bed and it was very quiet at night even being so close to a busy area. Just 5 minutes’ from the nearest sandy beach, Collingwood Hotel offers free Wi-Fi and free on-site parking.. Everywhere clean and comfy. Food excellent. Pat n Christine wonderful hosts. Located in Blackpool, the family-run Danescourt Lodge offers free Wi-Fi throughout. This was a great hotel for our 2 day family break! The Inglewood Hotel is just a few minutes' walk from Blackpool Beach. Offering free on-street parking, the family-run Inglewood is located in the quiet North Shore area and close to Queen's Promenade.... Lovely and friendly staff, upgraded to a king room as it was available. Kingsbury Hotel in Blackpool features a bar and on-site dining. This hotel offers free WiFi. Blackpool Pleasure Beach is 1640 feet from the hotel. Clean, comfortable and convenient. Featuring a shared lounge and free WiFi, Rock Dene is located in Blackpool. 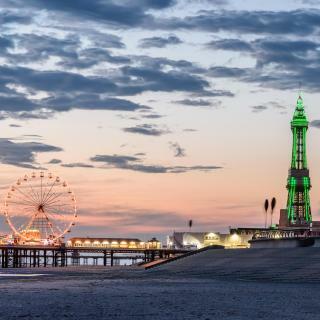 Located around an 18-minute walk from Coral Island, the hotel is also one mile away from Blackpool Tower. Andy and Bernie made us feel so welcome and at home. Featuring a shared lounge and free WiFi, Briardene Hotel is located in Blackpool, 4 miles from North Pier. The property has a bar, as well as a restaurant serving British cuisine. Had a fantastic stay at Briardene..staff were lovely and very helpful. Food was excellent. Aparthotel Blackpool is conveniently located just a 2-minute walk from Blackpool Pleasure Beach and Sandcastle Water Park. It offers modern accommodations with free Wi-Fi. The hosts were very warm and welcoming nothing we asked was too much for them . 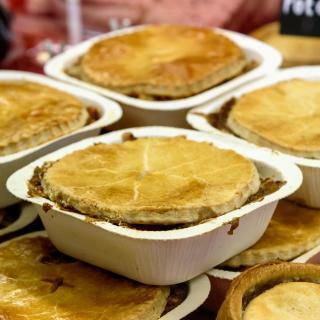 Located a 2-minute walk to the sandy beach, Blackpool Tower, and Coral Island Casino, the Beeches Hotel is also less than half a mile from the Winter Gardens and town center. The service was so friendly and they could not do enough for us. Located on the main promenade of Blackpool’s famous seafront, The Maples Hotel is a family-orientated seaside hotel. Free limited parking is available at this property. Great location, immaculately clean, comfortable bed, modern bathroom, superb view. Hotel Rouge features a terrace, shared lounge and bar in Blackpool. Everything about this lovely BnB was great. From the warm welcome to the glorious furnishings. Located in Blackpool, within a 15-minute walk of Coral Island and 0.9 miles of Blackpool Tower, The Oxfordshire Hotel provides accommodations with free WiFi. This was perfect, it was the best nights sleep I've had in ages. Close to Winter Gardens, Hounds Hill shopping center and Blackpool Tower, this charming hotel with bar offers full English breakfasts and helpful service. Lovely staff , excellent breakfast , very clean and spacious rooms for a b&b. 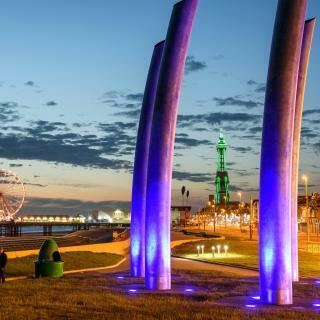 Less than 10 minutes’ walk from Blackpool Tower, this guest accommodations features an on-site bar. In general everything was great Inc food, bed and very clean rooms. Which hotels in Blackpool offer an especially good breakfast? For hotels in Blackpool that serve highly-rated breakfasts, try The Inglewood Hotel, Hilbre Hotel, and Hotel Rouge. What are the best hotels in Blackpool near Blackpool Tower? Some of the best hotels in Blackpool near Blackpool Tower include Sorrento House, The Almeria and Birchhouse. How much is a hotel in Blackpool for this weekend? The average price per night for a 3-star hotel in Blackpool this weekend is $148 or, for a 4-star hotel, $184. Looking for something even fancier? 5-star hotels in Blackpool for this weekend cost around $288 per night, on average (based on Booking.com prices). Which hotels in Blackpool are good for couples? These hotels in Blackpool are highly rated by couples: Hotel Rouge, The Oxfordshire Hotel, and The Inglewood Hotel. Which hotels in Blackpool are good for families? Many families visiting Blackpool loved staying at The Oxfordshire Hotel, Adelaide Lodge, and Hotel Rouge. How much does it cost to stay in a hotel in Blackpool? On average, 3-star hotels in Blackpool cost $75 per night, and 4-star hotels in Blackpool are $103 per night. If you're looking for something really special, a 5-star hotel in Blackpool can be found for $155 per night, on average (based on Booking.com prices). Which hotels are the best ones to stay at in Blackpool? The Big Blue Hotel - Blackpool Pleasure Beach, Blackpool FC Hotel, and Hotel Rouge are some of the popular hotels in Blackpool. How much is a hotel in Blackpool for tonight? On average, it costs $63 per night to book a 3-star hotel in Blackpool for tonight. You'll pay around $76 if you choose to stay in a 4-star hotel tonight, while a 5-star hotel in Blackpool will cost around $159, on average (based on Booking.com prices). 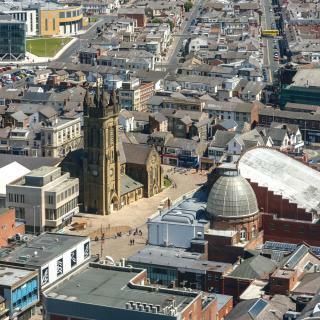 Which neighborhood is the best one to stay at in Blackpool? North Shore, Blackpool Town Center, and South Shore are popular with other travelers visiting Blackpool. Which hotels in Blackpool have nice views? Sandford Promenade, The Fossil Tree Hotel, and Highbury Hotel got great room view-related reviews from travelers in Blackpool. 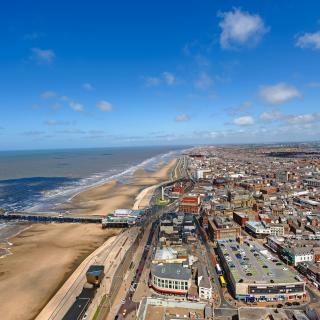 A favored vaction spot since the Victorian era, Blackpool is a traditional English seaside town. 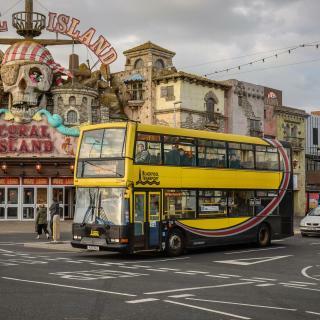 Amusement arcades and crazy golf courses line the promenade and dotted between them are plenty of places to pick up fresh fish ‘n’ chips and Blackpool rock. On the 5-mile sandy beach, children can enjoy Punch and Judy shows and donkey rides. Old-fashioned entertainment at its best. At the other end of the scale is the Blackpool Pleasure Beach, a fairground complex comprising a variety of rides, including The Big One - once the world’s tallest and steepest rollercoaster. They actually had to get permission from nearby Blackpool Airport to erect it! More seaside pursuits are on the town’s 3 piers, one of which is Grade II listed. 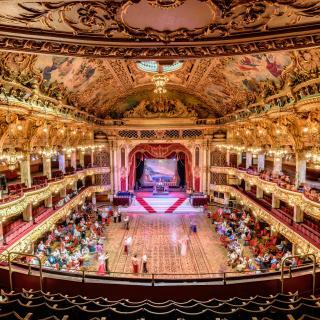 However, the most recognizable landmark is the Blackpool Tower which houses a circus, 4D cinema and a world-renowned ballroom, to name a few. Modeled on the Eiffel Tower, it is spectacularly lit during the annual Blackpool Illuminations, when the whole town is bathed in bright lights. The trams plying the prom are also lit. Look out for the one shaped like a ship. A popular bachelor and bachelorette destination, Blackpool has accommodations ranging from North Shore hotels to South Shore B&Bs - see Booking.com for the best choice. Been going to Blackpool since I was child with my grandparents. Go there now with my boyfriend who also went with his grandparents. Doesn't matter how many times I go, I always have a smashing time. Sort of my guilty pleasure. Done everything possible in Blackpool, visited the dungeon, aquarium, Madame Tussauds and Pleasure Beach. Also been to the different piers, bars and shops on the high street. Always something to do! We've stayed in family run B&B' and also the BIG BLUE hotel and both times we've had a fab time. Great place for families and couples! We are due to go back very shortly! Harry Ramsden's was the highlight of our overnight stay. Harry Ramsden's was the highlight of our overnight stay. Poor Blackpool has seen better days. The tower is iconic but surrounded by tired run down buildings and pound shops. Its still a place people are drawn to and with an influx of new life and not the people out to make a fast buck it could be glorious again. It has something for everyone, literally everyone. It has something for everyone, literally everyone. 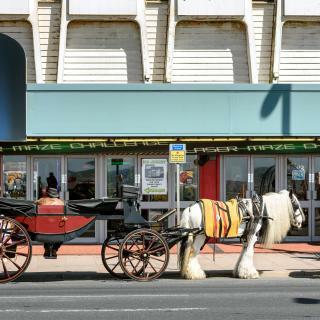 If you want an off-the-wall stag-do, if you want a peaceful sea-side retreat, if you want a high-energy adventure for the family, if you want to step back in time.... Blackpool has something to suit. Getting around by tram was a snap, although it's not so big that an intrepid walker couldn't do it all by foot. Although geared toward groups in general, for a solo traveler there's plenty to see and do. Try stepping off the main drag for some hidden gems and friendly locals ready to advise. Great! Loved it. Good for kids as well. Went with my partner this time but wi defo return with the kids also. Went and saw the funny girls show - wasn’t our cup of tea but would be a good nite out with the girls. Went to the tourist places (pleasure beach etc) really good. Came across a comedy station place just opposite the Blackpool tower entrance near Harry ramsdens - loved it! If you’ve never been you must visit. If you’ve never been you must visit. Friendly northern welcome. Fabulous promenade & beaches. Only disappointed is that you can’t take dogs on the beach after May 1st through to the end of the summer season. The beach was good, best time to visit is July nice place to visit ,please check Uk weather before booking! Nice pubs and entertainment near the coast. An Blackpool a to z map is a must. Always book travel and accommodation tickets in advance and always download the tickets to show in journey! Our stay was amazing! The hotel manager was so kind and helpful, always making sure that we were happy with everything, always happy to do anything for us and always giving us amazing recommendations for fun things to do and good places to eat. The hotel is clean, tidy, cozy and not to mention how comfy the beds are.. better than my own if I admit. The front of the hotel looks right into the Blackpool tower and gives a beautiful sight at night time. This hotel is definitely worth the price and I would go back with a doubt! Guy who runs the hotel was lovely and friendly couldn't be nicer. Sorted us with parking and made us feel at home. He asked us about our trip told him it was our sons 3rd party we went a walk and on our return to the room there was a birthday card and some sweeties for him which was just lovely. Highly recommended this place to anyone going to Blackpool great location and hotel has everything you need. Very clean also. We will definetly use again. Room was clean and functional. Breakfast was excellent hot and good quality. Health spa staff very helpful. Pool, Jacuzzi and sauna are a nice facility clean and not busy. The best looking hotel in Blackpool and away from the crowds it may be a little more expensive but in my opinion worth it. Tram stopped right outside hotel so easy access up and down the prom and about 10 minute walk to north pier. Best thing about this b&b was the owners Caroline and tony, so friendly and cant do enough for you, we had a late checkout of 2pm but as our train home wasn’t till 7pm Caroline let us stay in the room untill we needed. The location is great, 2min walk to the Blackpool tower. The breakfast room and breakfast was lovely. Warm, cosy and made to feel really welcome. Nice decor, unlike some of the shabby seafront hotels in Blackpool. Clean and very comfortable. Family room was a good size, as was the bathroom. It's in the quieter end of town but there's a tram stop right outside or a short walk to the attractions. Sharon and Dave from the Chadberry House Hotel are lovely hoasts, The hotel is very clean and tidy, lots of little extras as well like toy box for children very happy with the whole stay.. all the family enjoyed the time there. Would be happy to stay there again. The owner was nice lady she allowed us to check in early also breakfast served was generous and location is very centre to tourist attraction plus point is parking it is hard to find hotels with parking as it is in centre. Amazing find very stylish, clean & homely 10/10. Great hosts tea, coffee, sugar provided. Loverly white bedding & towels. Great location 5 mins from seafront, Blackpool North station & Sainsbury’s. Clean hotel with good facilities and reception staff provided good info on how best to travel around the area. Convenient tram and bus transport outside hotel. I liked everything!!! Was perfect breakfast! Was clean and comfortable room! In room you have everything what you need! I think is the best hotel in Blackpool!